Thermography uses a specially calibrated infrared camera to essentially take a thermal “picture” of the physiology of a person’s body. Because of the accuracy of these medically dedicated thermal cameras, they can see pre-structural changes in a patient’s body and to understand ongoing patterns. Because even the smallest changes can be seen, thermography is a proactive and a preventive form of healthcare allowing the gap between disease and diagnosis to close. Breast thermography is a means of preventive and proactive healthcare that medical professionals can use to gain the earliest insight regarding changes in breast tissue. Sensing the development of a breast lump can take years. However, with thermography, medical professionals can help women make lifestyle changes and possibly receive non-invasive treatment earlier than other detection means. 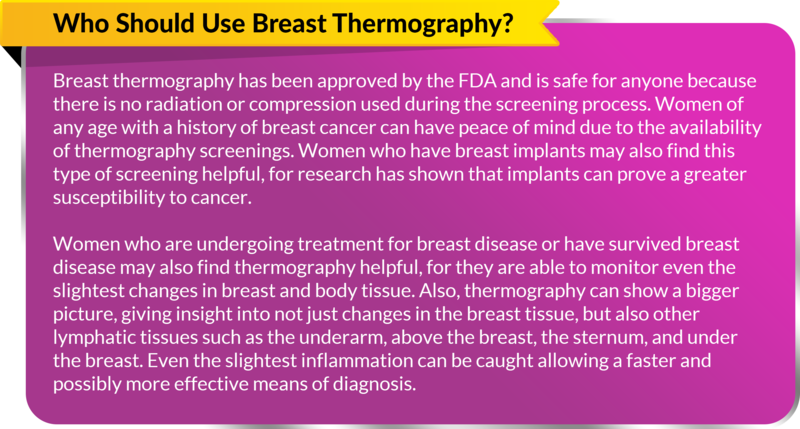 What Breast Thermography is Not? Breast thermography is very different from an MRI, mammogram, and breast ultrasound and is by no means a substitute for these other screening methods. These screenings are for looking more closely at anatomy and for pathological diagnostics, whereas thermography is looking at the physiology or function of those same tissues. To understand the differences, think of MRI’s, mammograms, and breast ultrasounds as looking at the structural elements of a house and thermography as a means for looking at what people are doing in the house.